Mind map users need to deal with the rest of the world, which lives in lists and spreadsheets. Even MindManager users themselves often have a need to look at their map context in a less graphical format for analysis or printing. 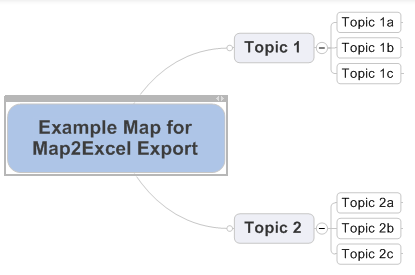 Map2Excel is a simple no-frills macro for exporting a map or portion of a map to Excel. It can be launched as a macro or using the new m2e GyroQ tag. If you select the central topic or nothing is selected, the whole map is exported; otherwise the children of the selected topic are exported. This tool is now available as an MindManager add-in. For more information visit http://map2excel.com. Very nice tool. Something I will use quite often. There seems to be a little issue with the text length. If the text in MindManager gets too long the macro runs into an error in the subroutine at that following lines. 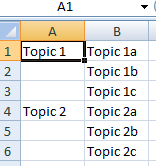 I guess the issue is that Len(t.Text) is longer than the allowable column with in Excel. Not sure how to fix it but though. Thanks for the catch Bernhard. I uploaded that sets the maximum column width at 80. I don’t the precise maximum but that seems like a reasonable starting point. It is on the wiki and in the beta setup (setup112.exe). That worked and actually allows modification of the maximum column width – a nice additional feature. Thanks for the update. Great macro – I use it a lot for exporting my “TO DO” lists. – Text markers (Especially “Resources”). Please keep up the good work. Thanks! Hi Andyman — Good suggestions. 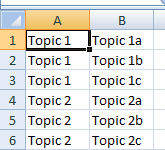 I modified the Map2Excel macro so that it now has the option for “extended information”. If you choose this, it puts the priority, completion status, and resources in the first few columns. What is more interesting with this version is that is now also includes hyperlinks to the topic and, if present, the link present on the topic. This could be a good way to jump back to maps or, if you are working from a dashboard, to the underlying map. The new code is in the “beta” ao-setup program as well as in the wiki. It can be run directly or called by the “m2e” gyroq tag. Am excited by this and trying to trial however I get this message. I have pasted the code into the macro editor and saved it. I have also saved the ao_common macro in the same way and in the same directory. I have added the macros to the MM Macro tool. Please check that the macro is valid. Try opening the macro inside the macro editor and hitting the play button and seeing where it points out the error being. The error will be listed in the lower left corner of the macro window. It could be you have some stray text text at beginning or end. Thanks. Without really knowing what I was doing I merged the macro with the ao_common macro to create a single macro and everything works fine. Great results – thanks. An error while trying to access the macro: C:\Program Files\Mindjet\MindManager 8\AO\ao_map2excel.mmbas. Please check that macro is valid. Do I miss any steps before calling Map2Excel macro? Please help advices. Many thanks. Sorry — there was a typo in the macro (‘uses “ao_common.mmbas” should be ‘#uses “ao_common.mmbas” at the top). A fresh setup (setup134.exe) has been uploaded with corrected macro. I have added “#” as instructed. Now the Welcome to Mindmap.mmap file is being converted to Excel topic by topic visually. How fantastic the macro is! The tabular format really meets my need of data analysis. Thanks a ton. Great tool. Very helpful. I am in need of going the other direction. From Excel to MM8. I cannot seem to find anything besides a very basic macro. Is there some other tool you may have that does this? Hi MIke — What would your input Excel file look like and what would you want it to turn into on the MindManager side? It is pretty straightforward to go from MindManager to Excel in a defined way, but the reverse requires some definition/predictability on the Excel side. Can you please give me a hint what to do next? I have no clue about macros. Hi — Sorry for delay in reply. It looks like you need to also download ao_common.mmbas into the same directory as the macro. no problem, your reply arrived just in time. : ) Thank you very much for your support. Now it works great. I don’t know if it’s possible, but maybe it is because I have mindmanager 8 in stead of mindmanager 7 like all people above! Or I have a newer version of Excel? My guess is that the problem is that you need to go into macro editor for this macro and choose “edit”, “references”, and check off the right Microsoft Excel object library. Interesting that it works with your modification to the “dim” statement! Is there any way I can get the macro to also export the topic notes? Good suggestion. I have added notes export to the latest beta version in the setup.exe and to the wiki. Note that it only exports extended information for the final children topics in the map. Notes (and other extended information) in parent topics isn’t exported. I am looking for a tool which can import data from Excel to MindManager. So the data is presented from Tabluar/Outline format into MindManager Map format. Can anyone help? Hi Annie — Are you looking for tools that do precisely the reverse of what is shown above for this tool? I’m not familiar with anything out there right now. I think macros could be written to do this, but it would take several hours and I don’t know when I’ll find the time. I’d also need to figure out how to connect up to a particular existing spreadsheet rather than just create a new spreadsheet as is done here. The “next action” on the blog is to do some programming tutorials, so perhaps this could be the example we use. I am getting the same Error as Jorik. Can you please help me? Did you try editing the macro and changing the line with dim excelapp line as he did and/or checking the references? I wonder how difficult it might be to add or enable excel’s outline feature while exporting using your macro? very nice Macro, I’m using it now for three weeks without any problems. I’ve only one problem, I need an extra column with an link to the attachment. How can I add a column with a link to the attachment? The existing macro links back to the topic itself, from which you could click on the attachment to open it. I don’t believe there is a way to link back to the attachment(s) in one click. It might be possible to write a macro to follow the link and then open the 1st attachment, or to save the attachments out to a temporary directory and then link to them there but it would take some focused time. What type of application are you using the macro for? Fantastic Macro, thank you for your time in putting this together! I’m using MM9 and the Macro works great. Is it possible also export Tags associated with each item? It will only export the tags for the terminal topics in the tree. Please let me regarding this. I have made the change with respect to “excelapp” and also added the MindManager references. Hi Vijay — Sorry for the delay in my reply. My first guess is that there is something wrong with the references given that I use Office 2007 and 2003 and haven’t moved to 2010 yet. Can you open the macro in the macro editor and click on “Edit, References” and ensure that the Microsoft Excel 5.0 Object Library is checked? It might need to use a later version if 2010 doesn’t still have the 5.0 object library available. I had the same problem as Vijay, but with MM 8 and Excel 2010. Strangely I didn’t have problems with the beta version of Office 2010. The inclusion of the Microsoft Excel 5.0 Object Library worked perfectly, just had to modify the newly shown AO-MAP2EXCEL to open in a menu (I chose “Save As”). Things are getting a bit complex these days in terms of the diversity of versions of software out there. Its difficult for me to make sure I have installation that works for all these scenarios. I could do it, but I’d need to triple my prices :-). I need to ask users/potential users to please post a comment anywhere on the blog when you run into a road block, and I’ll try to help you out asap. I would be appreciate if you could find the base of the error. 2) Also I just want to know if there is any code that save the attachments in separate folder and code them. or after making an excel file attach the attachment to their related rows? Hello Mohammad — Can you check to see what the error message is in the bottom left corner of the macro editor when it gets stuck? I haven’t seen issues at that line before. I haven’t done any work to add attachment to the export. I didn’t even realize you can bring attachments into Excel like that. Its not something I can work on in the near term. My guess is that when you cut/paste the code in from the wiki you missed the last (End Sub) line from one of the macros? I’ll check and inform you. Thank you so much this is fantastic, you dont know how much time you have saved me. Thank you Im so indebted. for me, it seems as if this add-in might be my rescue. But it doesn´t work. I install and install but it doesn´t appear in mm. I have MM7 and Excel2010. Hi Susanne – the addin is only compiled for v8 and v9. You can install the mindreader for gyroq addin and run the map2excel mmbas macro to get similar functionality. I am trying to find an executable file for “Map2Excel” and download it. But, where the F… is the Map2Excel exe file anyway? All this Ural send me to another page and another page again.